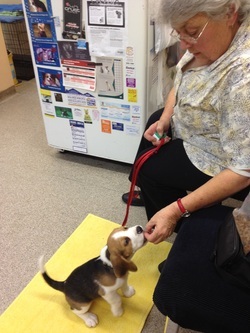 Puppy Preschool is held at the Holland Park Veterinary Clinic on Tuesday nights from 7-8 pm. Puppy preschool is designed for puppies that have had at least one vaccination and are aged between 8 weeks and 16 weeks at their first class. The first week is an orientation week - so is PUPPY FREE. The orientation night, does tend to go for 1-2 hours depending on questions. The course costs $180 for the 6 weeks. You must present your pups current vaccination certificate prior to the first dog inclusive night (week 2). The program uses positive reinforcement training - using a clicker and high value food rewards. You will be supplied the clicker on your first dog free orientation night, as well as a summary of orientation and weekly emails with handouts and discussion on what we have learnt. During the course we cover canine socialisation and all your basic behaviours such as sit, drop, leave, look at me, rest comfortably on your mat etc. I will also discuss and give you management programs or solutions to the problems most puppy owners face, including toilet training, jumping, mouthing and chewing. The puppies spend time on lead, and will have short interactive play sessions if deemed appropriate. During the course I will talk a lot about canine body language – this will help you understand your puppy and what is good and what is bad for him/her. This will help you as your puppy's guardian to take measures to help and protect them in future. During the course we will also cover quite a bit about how dogs learn, enrichment and some trick training. The class has a maximum of 4 puppies.